The first time I ever had chicken and waffles was a loooooooooooong time ago. I’m pretty sure it was in NYC, at Cafeteria. It was one of our first trips together as a couple and even back then (in 2007, what?!) food was something that counted as a tourist attraction. It was three years before I could creep on people eating chicken and waffles on Instagram, so I did what everyone did back in the day: I read Yelp. Yelp told me to try the chicken and waffles so we did and I fell in love with the combination of crispy, fluffy waffles and crunchy deep fried chicken drizzled with maple syrup. The funny thing is, even though I fell a little bit in love, I’m not a huge chicken and waffles person. Fried chicken, absolutely. Waffles? Yes please! But if I had a choice, I would absolutely have my fried chicken with fries. Or biscuits. Or mac and cheese…speaking of mac and cheese, that’s exactly what I ordered once when we did a late night run to Roscoe’s (LA’s very own dedicated chicken and waffles house). The waitress thought I was a little crazy because all I wanted was a side of mac, but when you’re craving noodles in cheesy sauce, nothing else will do. Plus, I got to eat some chicken and bites of waffle off of Mike’s plate, so really, it was the best of both worlds. Anyway, seeing as I don’t really have deep-seated love for chicken and waffles, why did I make this? The simple answer: I had buttermilk in the fridge. I had bought it to make dressing for grilled broccoli and had a whole carton leftover. I cycled through making biscuits, pancakes, and then landed on waffles. Which then begged for buttermilk fried chicken to go with. Two recipes with buttermilk? YES, said my compulsive empty fridge loving self – something about a too full fridge always makes me uncomfortable. 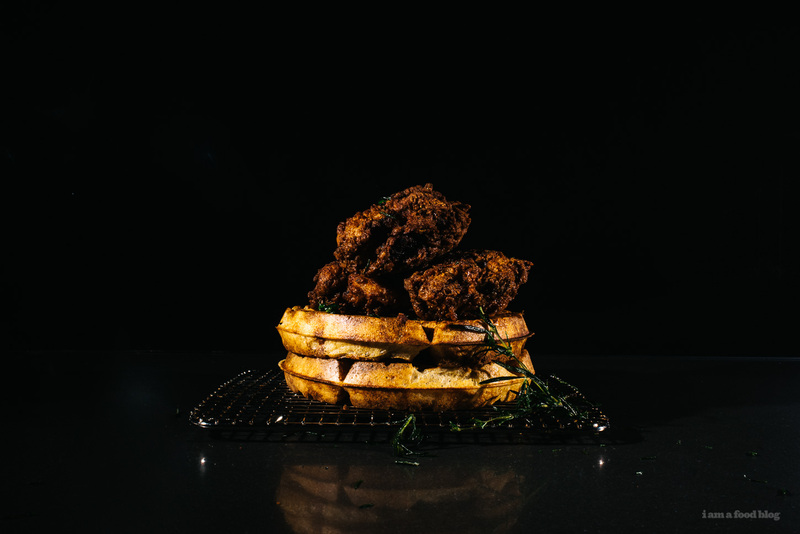 I wanted to do an overnight brine on the chicken – brined fried chicken is always so juicy, so I went on a little internet search to see if there were any overnight waffles. 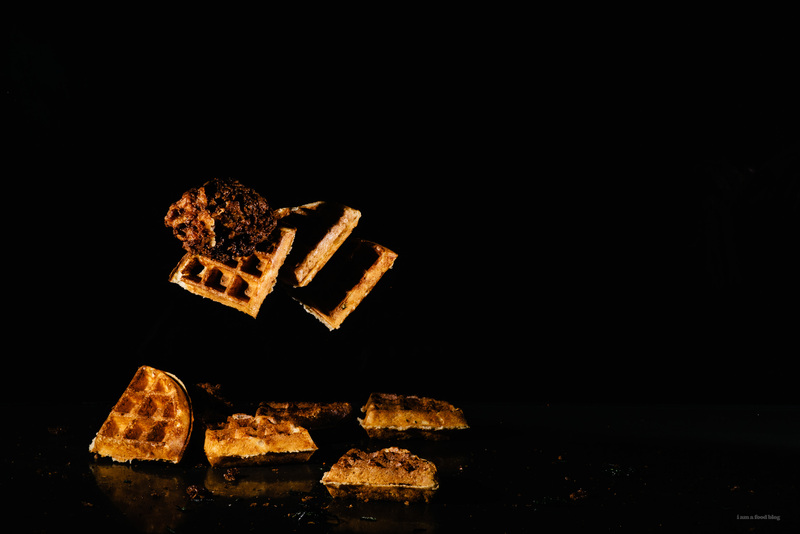 I was in luck: it seems like the entire internet is obsessed with overnight yeasted waffles. The yeast gives the waffles a more complex flavor than your ordinary waffle, which I thought would go well with chicken. I subbed in buttermilk instead of milk (gotta use it up!) and bit of rye flour for some nuttiness. 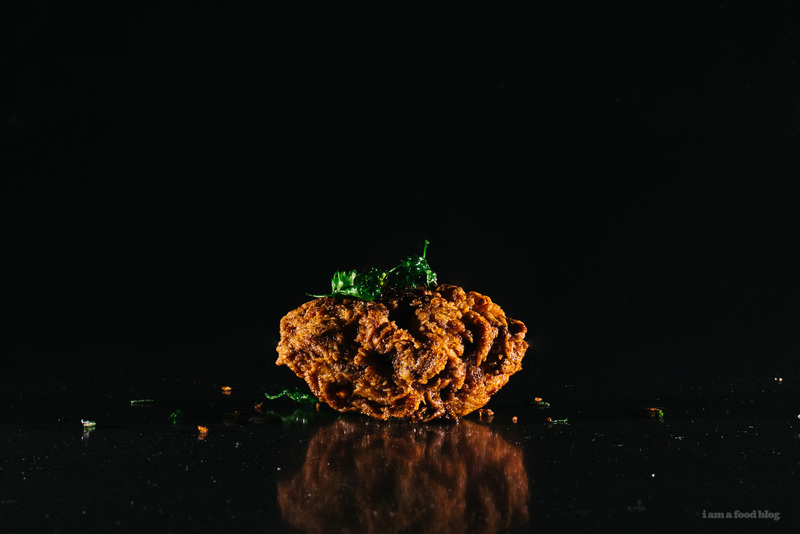 The result: ultra light, crispy, lacy edges that were the perfect compliment to the uber crunchy double dipped fried chicken. 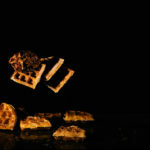 These waffles are based off of an famous Marion Cunningham yeasted waffle recipe. I switched out the milk for buttermilk and added in a little bit of rye flour for a bit of nuttiness. 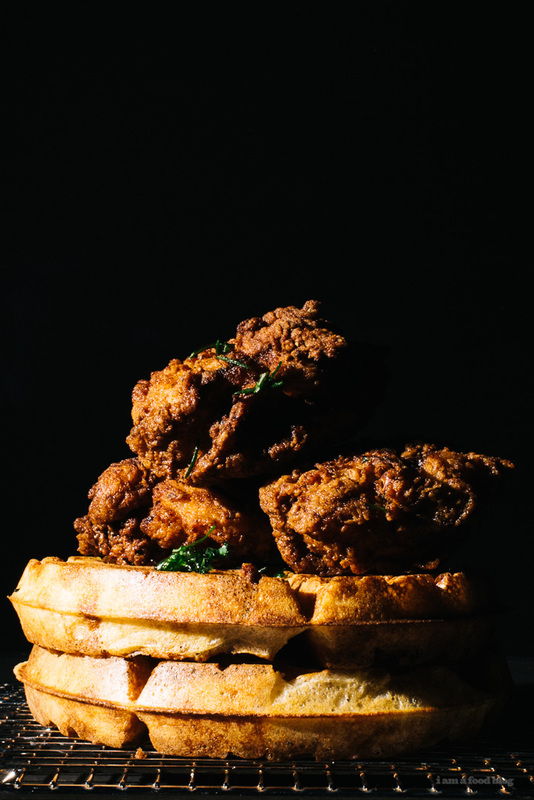 These waffles perfectly complement fried chicken: light, crisp, slightly malty, with a hint of sourdough. 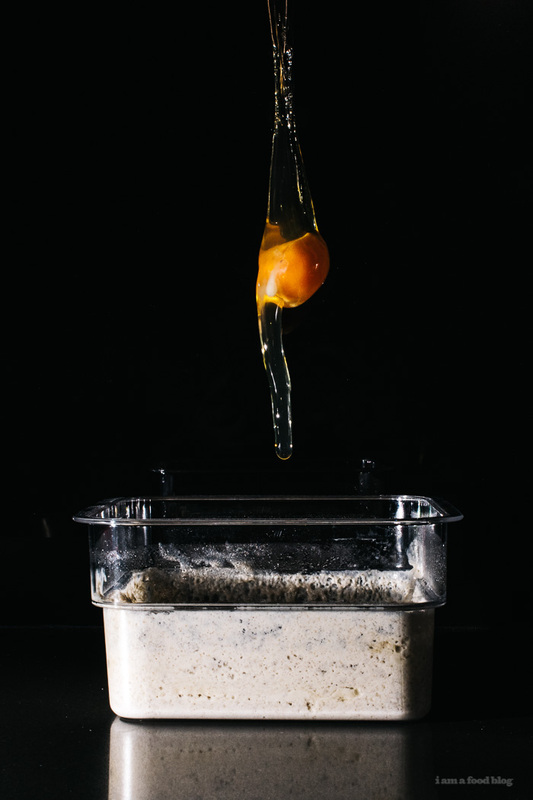 Most of the recipes I’ve seen on the internet advise you to leave the batter out at room temperature, overnight, but if that makes you nervous, feel free to let it rise in the fridge. I left my batter out for most of the night and then, come early morning, popped it into the fridge because I wasn’t planning on making waffles until dinnertime. In a large bowl or container with a lid (the batter will rise overnight), sprinkle the yeast over the warm water and let proof for 5 minutes. Stir in the buttermilk and butter. In a small bowl, mix together the flours, salt and sugar. Add to the yeast mixture and mix until smooth and blended. Cover and refrigerate on the counter (or in the fridge) overnight. Right before making the waffles, beat in the egg. Add the baking soda and stir until well mixed. The batter will be quite thin. 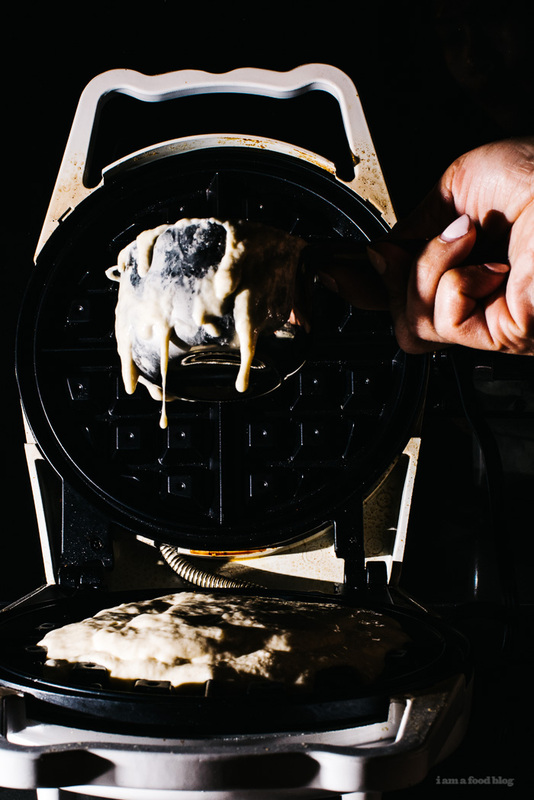 Make waffles according to your waffle machine until golden and crisp. Enjoy hot! In a pot, bring the water to a boil and stir in the salt, until dissolved. Remove from the heat and add the honey, bay leaves, garlic, peppercorns, and lemon juice. Let cool completely and then submerge the chicken. Brine overnight in the fridge. The next day, 1 hour before cooking, take the chicken out of the brine and pat dry. Let come to room temperature, for 1 hour before cooking. In a deep, heavy-bottomed skillet, heat up 2 inches of oil over medium-high heat. You want to make sure the oil does not come up more than 1/3 of the way up the pot. 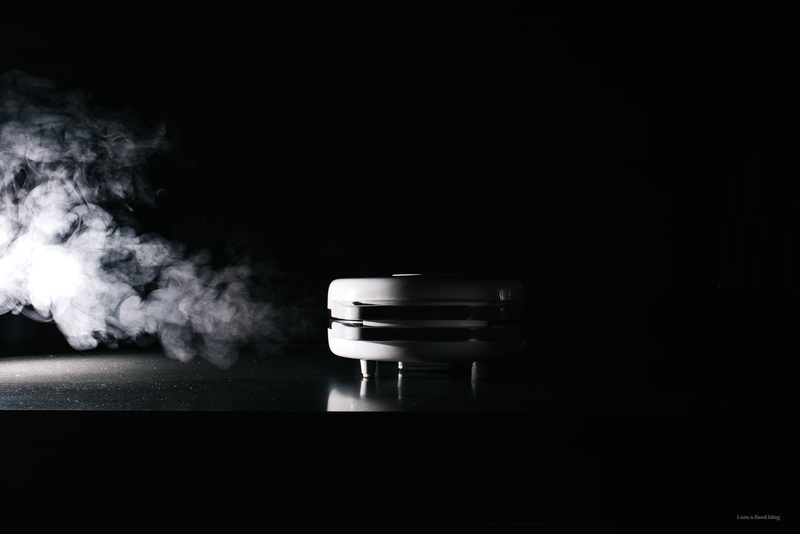 Heat to 350°F. 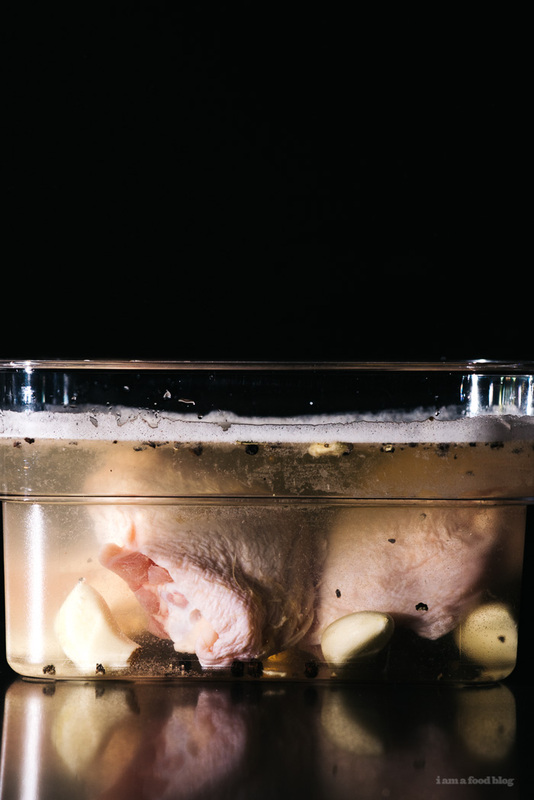 While the oil is heating, get ready to dredge the chicken. Whisk together the flour and spices in a deep bowl. Pour the buttermilk into another deep bowl. Just before frying, dip the chicken into the seasoned flour, then the buttermilk, then the seasoned flour. Set aside coated pieces on a tray. When the oil has come up to temp, gently lower the pieces of chicken into the oil. 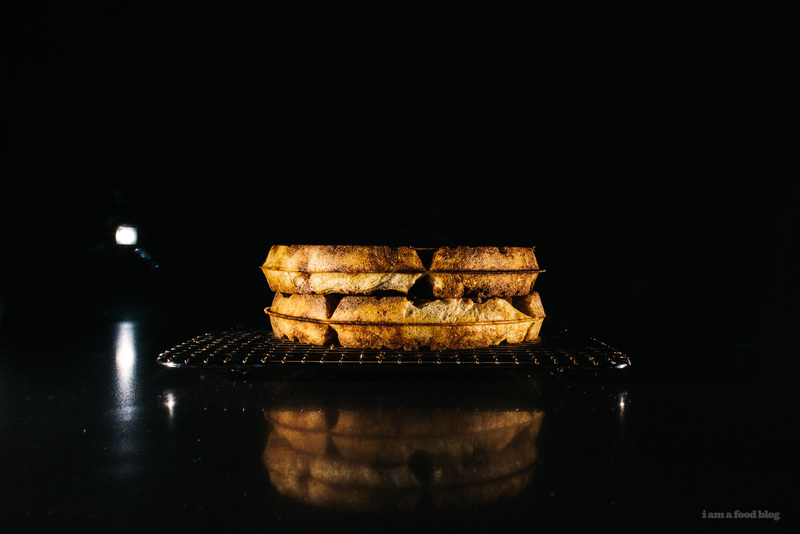 Fry, turning with tongs every 1–2 minutes and adjusting heat to maintain a steady temperature of 325°, until skin is deep golden brown, about 12 minutes. 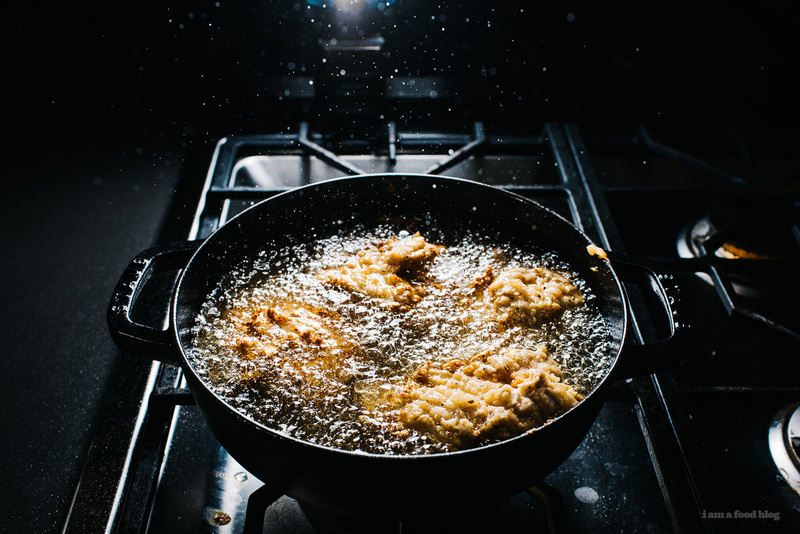 Using tongs, remove chicken from skillet, allowing excess oil to drip back into skillet; transfer chicken to a wire rack and let cool for at least 10 minutes before serving. Enjoy! GIRL. these photos. this recipe. everything. wow!!! The combinations of chicken and waffles is very fresh!! !